abroad in a quest to control the means of production. China’s attempts to control the means of production in other countries just rising out of developing world is causing tension with its natural allies, and could be just the first step in an ever-escalating series of resource-based conflicts. 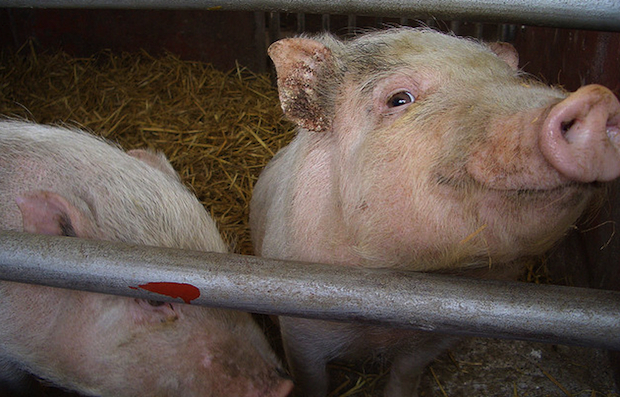 shortfall led to soaring pork prices a year later. Hence, the pork reserve, which would allow Beijing to move quickly to keep its citizens in ribs should there be another interruption in production. China’s strategic pork reserve is the direct consequence of an emerging, meat-eating middle class and a government determined to feed them. As the sociologist Mindi Schneider points out, Deng’s economic reforms in the late 1970s privileged industrial farms over small plots to guarantee a steady supply of cheap pork. As a result, the average citizen’s meat consumption has quadrupled since 1980, while pork consumption has doubled in the last two decades. And China’s meat packers are just getting started–only 22% of China’s pork production takes place in industrial feedlots, compared to 97% of America’s. In the future, it will always be the Year of the Pig. turning to other countries for the farmland necessary to feed the pigs. Once the Politburo decided to feed China with pork, the question then became: What would China’s pigs eat? One answer is corn. Last week, China purchased 540,000 metric tons of U.S. corn for delivery after August, according to the USDA, more than agency’s forecast for the entire year. About 70% of that order is bound for making feedstock, mostly for pork, which last year required 74.5 million tons of corn–up 20% from 2009, according to China’s Agriculture Ministry. But China’s corn imports–1.5 million tons last year–pale in comparison to its reliance on foreign soybeans. China imported more than 50 million tons of soybeans in 2010, mostly from the U.S. and Brazil, accounting for more than half of the global soy market. They also comprised almost three-quarters of China’s soy consumption, according to Schneider, and were used exclusively for animal feedstock and cooking oil. 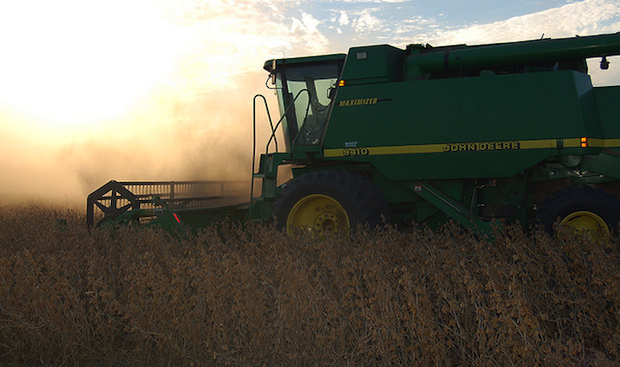 The USDA expects China’s soybean imports to rise more than 50% by 2020. It hasn’t helped that China actually lost 20 million acres of farmland between 1997 and 2009 due to natural disasters and rapid urbanization. Rather than guaranteeing its food security, China’s hunger for pork has made it utterly dependent on farmers in the Midwest and Minas Gerais instead. The Politburo’s solution was to command state-owned enterprises to “go out” and buy or lease farmland by the millions of acres. Last fall, Heilongjiang Beidahuang Nongken Group–China’s largest state-run agricultural conglomerate–agreed to develop almost 500,000 acres of farmland in Argentina, followed by another 200,000 hectares this year. A month later, Chongqing Grains’ announced a $2.5 billion deal to produce soybeans in Brazil. While much has been written about China’s lopsided deals in sub-Saharan Africa, Latin America is a more likely candidate to become the world’s next bread basket. Last fall’s controversial “land grab” report by the World Bank noted that, since 1990, Latin American soybean yields grew at twice the speed of America’s. “Brazil’s soybean technology is world class,” says Robert L. Thompson, a professor at the University of Illinois who is a former director of agricultural and rural development at the World Bank. “Soybeans came in as a new crop with no traditions and state of the art technology,” including soil remediation techniques capable of converting dry savannah to arable farmland. “While China is limited to 140 million hectares of agricultural cultivation, Brazil is using 80 million hectares now, has another 200 million hectares of pasture for cattle, and can insert another 140 million hectares into production without encroaching on ecologically protected areas,” argues Charles Tang, president of the Brazil-China Chamber of Commerce. His last point is a matter of some contention. While Brazil was able to quadruple its soybean production between 1995 and 2009, it came at the cost of nearly half of the Cerrado, destroying 1 million square kilometers of the richest savannah in the world. For that reason, among others, Brazilian officials have begun to balk at China’s overtures. Last summer, Brazil’s attorney general reinterpreted a law already on the books making it harder for foreigners to acquire land. “Nothing is preventing investment from happening, but it will be regulated,” he promised The New York Times. This has China’s advocates crying foul. Brazil has good reason to be nervous about its burgeoning trade relationship with its fellow BRICs. Nearly all of its exports to China are raw materials–including soybeans, which are crushed on arrival–while nearly all of its imports are cheap manufactured goods, which are crushing its industrial sector. Brazil may be booming, but so is household debt, leading to debates over whether a credit crisis looms. (The resource booms-and-busts of its neighbors Argentina in the 1940s and Uruguay in the 1950s aren’t very reassuring, either). China’s policies aren’t the problem, retorts Tang; Brazil’s sky-high interest rates and taxes are. But Brazil’s uneasiness and China’s voraciousness raises questions about the future of the BRICs (Brazil, Russia, India, China and, as of last year, South Africa) as a political and economic block. On the one hand, the five nations have already held three summits under the BRICs banner, but on the other they spent much of the last meeting in April lobbying China to buy less commodities and more manufactured goods. It’s a bad sign when you suspect your ally of trying to bankrupt you. While Bremmer predicts the BRICs will unite to defend their mutual interests in tactical matters, he also believes “food and water are going to be the new oil. Resource nationalism, export controls, price controls and all of that is going to create greater inefficiencies in production,” perversely spurring the desire to control the means of production. It all seems to be a high price to pay for moo shu pork for all.